Every restaurant has their “signature” creations that helps define it. It is a big part of what makes a restaurant unique. Acorn Grill is a one of a kind place and we wanted to have unique dishes, sides and flavors to lend their selves to our made from scratch favorites. Through the creative process that is cooking, we came up with one of our fantastic creations we affectionately call the Acorn Muffin. This sweet and palate cleansing treat is served with many of our flavorful meals (sixteen to be exact) at the Acorn Grill. 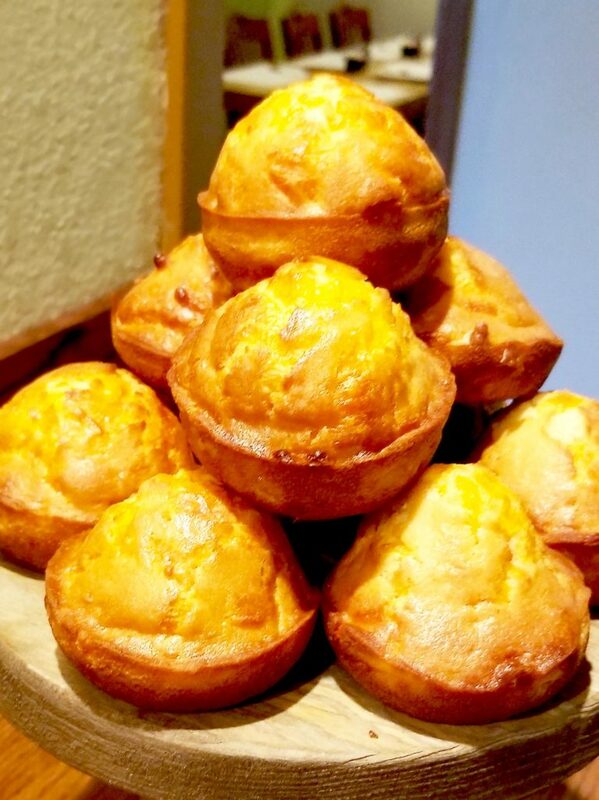 We knew it wouldn’t take long before customers started asking what the wonderful muffin consisted of, so we decided to share the steps of making them with you! Combine 4 tbsp of melted butter with ⅔ cup sugar and whisk until sugar is slightly dissolved. Stir in ¾ tbsp baking powder, ½ tbsp baking soda and ¼ tsp salt to the sugar and butter. Add in ¾ tbsp of white vinegar. Slowly add 1 ½ cups of flour and make a small indent in the flour. Crack 1 large egg and plop in the flour volcano. Mix ingredients slightly and begin pouring in ¾ cups milk slowly while continuing to mix together. When well mixed fold in shredded cheddar cheese. With a nonstick muffin pan spray with cooking spray (it’s been my experience that nonstick coated pans are never truly nonstick) and spoon in your muffin mixture until ¾ full. Place on center rack of your preheated oven for 15 minutes. When you begin smelling that amazing aroma of freshly baked muffins and they turn a beautiful golden brown you’ll know they’re nearly done. Grab a toothpick to place in a muffin, and if it comes out clean, you’re all set! Set aside and allow to cool if you can resist. You know, what makes the Acorn Muffins so special is that not only do people remember its sweet taste, but when in the kitchen, it is the very last food added to each meal. Some might even agree that the muffin itself carries the unique heart of the Acorn Grill.